Joppa is an ancient port. It was there that Peter opened the door to resurrection life for Tabitha. In Summit Park, the highest point of Joppa, are the excavated remains of a brick wall from an Egyptian fortress built by Ramses II. Ramses II is the “Pharaoh of the Exodus.” I don’t know if there any iniquitous thrones remaining from that period of history, but I am using the ten plagues of Moses as one model for praying for this city. How many idols we construct for protection! Father, we declare that You are the refuge and fortress of Joppa, Israel (Psalm 91:2). How many idols we construct to meet our desires! Father, we proclaim that Your Son Jesus is the Desire of All Nations (Haggai 2:7). How many idols we construct out of fear! Father, we shout out that You are merciful and gracious, slow to anger, and abounding in steadfast love and faithfulness (Exodus 34:6). Help Joppa to love You with all their hearts and with all their understanding and with all their strength, and to love their neighbors as themselves (Mark 12:33), for perfect love casts out fear (1 John 4:18). You revealed the inadequacies of the Egyptian deities’ protection from the locusts. You are the protection of Joppa against devouring. O, that Joppa would delight in You. Amen. Nut was the Egyptian sky goddess; Isis the nature goddess; and Set the storm god. We thank You for the manifestation of Your glory in creation. We thank You for protecting us from disaster. We thank You for the abundance of Your provision. We thank You for the defeat of the false belief that safety comes by serving the forces of nature or seeking guidance from the stars. By Your hailstones You displayed Your pre-eminence over Nut, Isis, and Set. We acknowledge there remains nature worship today, through the reading of horoscopes, Freemasonry, voodoo, etc. We humbly ask You to pour contempt on any demonic princes of nature worship in Joppa, Israel, and make them wander in trackless wastes. Amen. Many Egyptian deities were associated with healing. In Egyptian mythology, Sekhmet was originally the warrior goddess as well as goddess of healing. Sekhmet also is a Solar deity, sometimes called the daughter of the sun god Ra. Serapis was the god of healing, and Imhotep was the god of medicine and the guardian of the healing sciences. Isis was worshipped as the ideal mother and wife as well as the patroness of nature and magic. Moses threw soot into the air and the ashes became boils breaking out in sores on man and beast. So many times we have sinned in the by seeking remedies from idols, by not seeking our healing from You, and by not giving You glory when we are healed. Isaiah gave instructions for a poultice of figs to heal King Hezekiah. We thank You for the natural remedies. Jesus healed by His word and his touch. We thank You for supernatural healing. We proclaim good news to the poor of Joppa, Israel . We declare that broken hearts shall be bound and that captives and prisoners shall be freed. This is the year of our Lord’s favor! He shall take vengeance against the false mindsets and demonic strongholds that have wreaked havoc in Joppa. The land of Israel shall be healed, and their people healed, by the Blood of the Lamb. Amen. Jesus, please help me accept your timing. Jesus, thank you for sending your Holy Spirit to be with us and comfort us in all our griefs. Jesus, we ask you to heal us and our families and friends. Holy Spirit, please help me live and die in the hope of the resurrection. Jesus, thank you for coming into my life. Help us pray for and seek the peace of our cities, Lord. Father, thank you for the future and the hope you give us. Father, help me search for you with all my heart. LORD, bring the Episcopal Church out of its “Babylonian Captivity”. Thank you. Thank you, Jesus, for hearing us in our times of affliction. WORD: I have held you up by my hand. Trust me to lead you the whole distance. Ted and Camilla – Strength for Ted to continue to live independently and for God’s peace. Camilla got dizzy while driving home after an injection and totaled her car. Charlie – He has palsy in his hand; pray for better health and healing. Tiesha – She is going to a new doctor for her stomach condition; pray this doctor can treat her correctly and for healing. Pray for the fire victims. +++ Carlos – Pray for God’s blessing with his ministry of World Discipleship Christ Recovery Network Nourishing Your Eternal Soul (WDCRN NYES). Gary – Lift up the persecuted church. + Matt – Praying for a job. The last time he asked for prayer for help to receive benefits (from Social Security or Social Services?) and he got them – PTL! Dan – God’s leading for his daughters. Bill – Praying to find a place to live. LeRoy – God’s protection for him. Frankie – For God’s protection and provision. Tobias – Pray for him to follow God’s leading in his life. A day for little things, no doubt, but who wold dare despise it. (Zechariah 4:10a) Father, help me keep my attention on the tasks you have given me, not matter what their size or importance to others. Holy Spirit, help me find my peace in Jesus. Jesus, you are my hope. Holy Spirit, bring us to unity of purpose in sharing the good news of Jesus Christ and the kingdom of God. Jesus, I hear your voice calling me. Please help me follow where you lead. Thank you for being my shepherd. Holy Spirit, please give me discernment about any false shepherds so that I don’t follow them. Jesus, thank you for give your life for me. 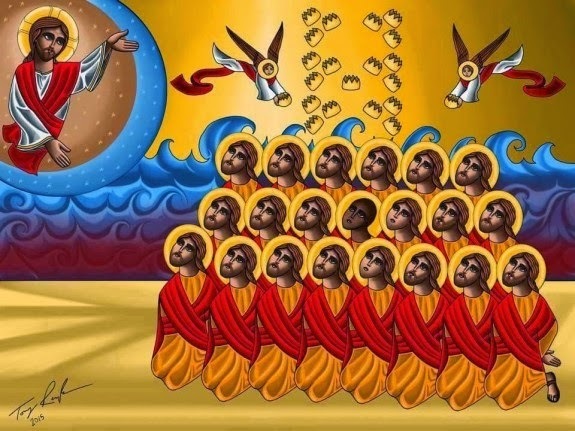 Thank you for the faithful Egyptian Coptic Christian martyrs who gave their lives confessing your name, Jesus. Father, there are so many hirelings in the church today — have mercy on us and cleanse the church by the fire of your Holy Spirit. LORD, send forth many throughout this diocese to preach the gospel of peace. Holy Spirit, please help me hear so that my faith is built up. Shepherd of Israel, seek me out and save me. Thank you. WORD: Pray for the fresh wind of my Holy Spirit. WORD: I love you. I hold you in my hand to comfort you. Psalm 31:24 WORD: I AM your hope and your strength. The recent martyrdom of Christians in many parts of the world reminds us that the call to follow Jesus is a costly call. It requires our commitment, our will, our time, our treasure and our convictions. The collect for Morning Prayer on Fridays reminds us that the way of the cross is our way of life. Jesus walked the way of the cross so that we might be saved, willingly and obediently suffering death on the cross so that we could inherit eternal life. As we continue on toward the height of the Christian year, the Resurrection of Jesus Christ, our Lord and Savior, I encourage you to walk the way of the cross with Jesus as His disciples. I encourage you to give up every other activity that may distract you and join in the services of Holy Week and Easter this coming week, so that you can know the saving love of Jesus Christ more fully and more deeply. I encourage you also to invite a friend, family member, or neighbor who does not know Jesus to come with you and experience His saving love and then share with them the hope that we have because of the Cross and the Resurrection. I pray that this Holy Week and Easter will bring each of us closer to the One who is the Savior of the world – Jesus Christ. As you continue in your walk with Jesus, I ask your prayers for the persecuted Church throughout the world. I also ask your prayers for all the people of this diocese, clergy and laity, that we may all be courageous and faithful in sharing our faith, strengthening one another as we walk the way of the Cross, filled with the joy that comes from knowing Jesus Christ, our risen Lord and Savior. May you have a blessed Holy Week and a joyous Eastertide. BIANCA — Anointed her with Holy Oil. Bianca says she has occasional demons about her that scare her. She says that when she comes to the table and gets prayers of protection, the demons go away. DARCY — Asked for prayer to be safe and protected. MARIA — Sought prayer for her husband BRUCE, who has heart problems. YOUNG FAMILY (No names) — Husband and wife and four cute children. Gave them a general prayer for provision and safety. They are very special to us. They speak very little English but they understand we want to help them and love them. We help them with food and clothing. Every Monday, Cheri comes out to give them a treat of “Goldfish” for each of the kids. LUCY — Friend of this young family, walks with them. General prayer for protection and well-being. DAVID — U.S. Navy veteran of the Vietnam War. Occasionally asks for prayer, but not this time. He wants to come by and support what we are doing so sometimes he just stops to say hello. This man has directed many, many people to us for prayer. He is kind of a private person, so he never asks for prayer if other people are around to listen. JOE and two other men (no names) — They came over as a group and when we asked if they wanted prayer for anything, JOE said “Yes, we ALL do!” Prayed for them all together to be safe and healthy. ALBERT — Very serious, pious young man who comes by now and then. He asked for prayer for healing for cancer victims all over the world. Sought clothing for some members of his family who are soon to mover here from Puerto Rico. Hathor is an ancient Egyptian goddess who personified the principles of joy, feminine love, and motherhood. Hathor is commonly depicted as a cow goddess with horns in which is set a sun disk with a sacred serpent. In Egyptian mythology, Apis or Hapis is a bull-deity, a god of strength and fertility. We thank You for the Word of God, Christ Jesus, in whom is life and through whom all things were made. We proclaim the name of Christ Jesus over Joppa, Israel. In Your plague upon the livestock of the Egyptians, You were passing judgment against the fertility gods Hathor and Apis. Triune God, You are the Tree of Life, Breath of Life, Lifeblood, Prime of Life, Light of Life, Path of Life, Wellspring of Life, Way of Life, Fountain of Life, Enjoyment of Life, Covenant of Life, Bread of Life, Author of Life, Spirit of Life, Fragrance of Life, Promise of Life, Gift of Life, Word of Life, Crown of Life, Water of Life, River of Life. May all of Your holy names be celebrated in this ancient port. Amen. We humbly implore You to grant supernatural wisdom to Prime Minister Netanyahu as he forms the new government of Israel. Bring to light any hidden darkness in any of the parties up for inclusion in the government and grant him the discernment and fortitude to eschew such choices. Amen. You are currently browsing the Lent & Beyond blog archives for March, 2015.